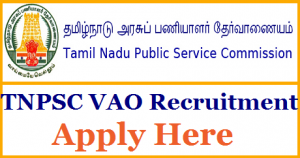 Tamil Nadu Public Service Commission has released the TNPSC VAO Recruitment Notification with a various number of vacancies. Now, Candidates who are interested in TNPSC VAO Exam can apply for 494 vacancies of Village Administrative Officer in the Tamil Nadu state. The TNPSC VAO Application Form will be available on the official website mostly from September End 2017. Aspirants who want to apply for TNPSC VAO Recruitment 2017 can read the complete details here. Here, we will provide the official website links to submit TNPSC VAO application form on the website for the TNPSC VAO Exam 2017-18. The Vacancy details for TNPSC VAO Recruitment 2017 has mentioned above. Contenders have to check the TNPSC VAO Vacancies in Tamil Nadu State in detail. The Complete details of TNPSC VAO Recruitment 2017 have mentioned above. candidates are advised to check the details carefully before applying for the TNPSC VAO Recruitment 2017. The important dates for TNPSC VAO Recruitment 2017 have mentioned above. Applicants have to check starting date for applying the TNPSC VAO Recruitment 2017 and the ending date for TNPSC VAO Recruitment 2017 carefully. Complete the submission process for applying to the TNPSC VAO Recruitment 2017 as early as possible. Do not wait for the last date. Sometimes server downs on the last date due to overload. Also, Check the eligibility criteria for TNPSC Village Administrative Officer Exam. So, we advise the candidates to apply for the TNPSC VAO Recruitment 2017 through the links provided below. TNPSC VAO Recruitment Age Limit is as follows. The maximum 30 years of age for Unreserved Category. Aspirants who belong to Reserved category can have maximum 40 years of age. Age relaxation for TNPSC VAO Jobs 2017 will be applicable as per govt. rules and regulations. Aspirants who apply for TNPSC VAO Recruitment must hold the 12th Pass certification from any recognized university or institute. The candidates must have knowledge of Tamil Language. Aspirants who hold higher degree or qualification are also eligible for the TNPSC VAO Recruitment 2017. The Selection Procedure for TNPSC Village Administrative Officer Jobs 2017 is based on the following two sessions. First step of TNPSC VAO selection process is Written Exam. The next step is Counselling Process. The Application charges for TNPSC VAO Recruitment 2017 will be updates soon. Aspirants can make payment of the TNPSC VAO Application fees through online mode by Debit/Credit Card or Net Banking facilities. Candidates are advised to note down the Transaction ID or Number for successful payments. Rs 5200 to Rs 20200 (Basic pay) with the grade pay of Rs 2400. Candidates will get other benefits under Tamil Nadu Public Service Commission norms and regulations. Search for the TNPSC VAO Recruitment Notification 2017 link. Enter correct details in online TNPSC VAO application form without mistakes. Upload the scanned passport photograph & signature. Pay TNPSC VAO Application Fee. Submit the TNPSC VAO Registration form. Download and take a print out of TNPSC VAO Application form for future reference.